When the steadfast Ruby Jane Whittaker drops out of sight, dogged ex-cop Skin Kadash sets out to discover what drove the woman he loves to leave her life behind so suddenly and without explanation. The discovery of a dead man in Ruby Jane's apartment and an attack by a mysterious stalker send Skin from Portland to California -- and into a charged encounter with her one-time love Peter McKrall. As questions mount and answers grow increasingly out of reach, Skin and Peter cross the country on a desperate journey deep into Ruby Jane's haunted past -- and toward an explosive confrontation which will decide if any of them has a future. This is the first book by Bill Cameron I have had the pleasure to read, but my no means my last! Talk about a page-turning, heart-pumping mystery thriller! County Line has it all! Skin Kadash is a phenomenal character; gritty, likeable, intelligent and has a certain swagger that will appeal to readers. After a month long break from Ruby, he decides it's time to get back together, but when he enters her apartment, he finds a dead body and Ruby no where to be found. He begins searching for her and it takes him into a dark and winding journey into Ruby's past. He meets up with Ruby Jane's old flame Peter McKrall. Along the the way, we learn more about Ruby Jane and her teenage past - and how it has shaped her into the woman she is today. Ruby Jane is a strong character who has been to hell and back. Skin wants to learn what has happened to make Ruby Jane run away from her life and him. 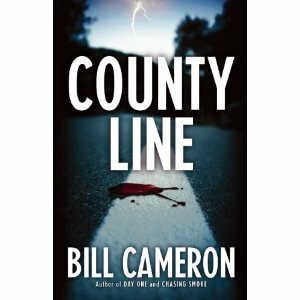 With twists and turns, mystery, drama, suspense and compelling characters, County Line is a book you won't want to put down! Mystery and thriller lovers will find themselves enraptured in Skin and Ruby's journey and Bill Cameron does it with flourish. Highly recommended! Bill Cameron, is the author of dark, Portland-based mysteries featuring Skin Kadash: Lost Dog, Chasing Smoke, Day One, and County Line. His stories have appeared in Killer Year, Portland Noir, West Coast Crime Wave, and the 2010 ITW anthology First Thrills. His books have been finalists for multiple awards, including three times for the Spotted Owl Award for Best Northwest Mystery. Cameron lives in Portland, Oregon, where he is at work on his next novel. For more information please visit http://www.billcameronmysteries.com, and follow the author on Facebook. This one looks good to me. Thanks for posting it Wendy.